The legislature party of Asom Gana Parishad (AGP) sat for a hunger strike in protest against the contentious Citizenship (Amendment) Bill, 2016 in Guwahati on Thursday. The hunger strike from 6 am in the morning till 4 pm is being organized on the bank of Dighalipukhuri. Participating in the hunger-strike, AGP president Atul Bora who had recently resigned as minister said that the the entire Northeast has launched agitations against the citizenship bill. “The Assam Government is trying to suppress the voice of protest instead of honouring the sentiments of the people. As a result, entire Assam is burning. For this the state government is solely responsible,” he said. Bora also said that it is unfortunate that Sarbananda Sonowal who once led the Assam Agitation as an AASU leader is now misleading the people with distorted statements on the contentious bill. Bora also said that the then government during the Assam Agitation tried to mislead the movement through distorted and fabricated statements. Senior AGP leader Brindaban Goswami also urged the Sonowal government to take a lesson or two from the pages of history. “The Citizenship (Amendment) Bill will push the Assamese community to the brink of destruction. Therefore, the people, parties and organizations have come out to protest against the bill. If the present state government do not read the writing on the wall, time will never forgive them.” Goswami further said. He also said that the struggle to safeguard one’s identity will continue in days to come. 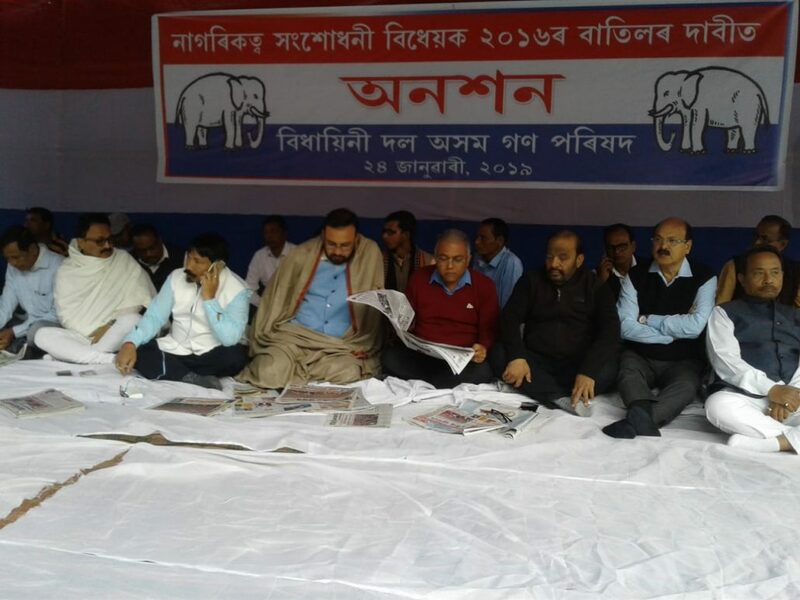 The hunger strike is also joined by several members of the legislature party of AGP including Keshab Mahanta, Phani BHushan Choudhury, Renuka Rajkhowa, Satyabrata Kalita, Pabindra Deka and Pradip Hazarika apart from several other leaders and party workers.